Infantguard are designers, manufacturers and suppliers of innovative child safety products. To the right you can see a scaled down version of the sites 'Product Focus' page and some custom Flash animation we created. (The animation demonstrates the fitting of their revolutionary new doorstop device). Intelligent content planning: Before we begin to even contemplate the design or structure of any Website we carefully address the issue of how any proposed content will be suitably organised and eventually presented online. Good content planning consequently ensures that we design accessible Websites with clear-cut navigation and uncomplicated well laid out structures. As a result visitors are able to find the information they want without any apprehension, delay or frustration. Original custom design, build: The overall look of the Infantguard site was designed to be bright and friendly to embrace the intended subject matter. We also wanted it to stand out from the multitude of similarly natured sites which all generally adopt pastel colour schemes. Custom means custom! 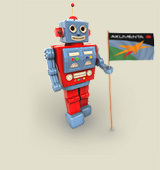 Unlike many of our competitors we NEVER utilise ready made generic design templates of any kind. We take great pride in painstakingly creating our own unique designs and layouts genuinely helping our clients stand out from the crowd. Photography: Various key photographs were expertly taken and meticulously enhanced / stylised for inclusion within the Infantguard Website and also for use with various printed media. This has included numerous processional retail product portraits. Stock imagery: Where appropriate professional stock imagery was carefully selected then heavily manipulated to excellent effect for use both on screen and in print. Custom artwork / image branding: We have performed numerous artwork and graphic design tasks for Infantguard covering a broad spectrum of intended mediums (for both screen and print). All of this work has been neatly pulled together by adopting a consistent and cohesive set of overall image standards. (Image Branding). 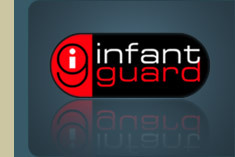 Logo design: Before anything else, our initial task was to produce a fitting logo for Infantguard. With this in mind we followed an intuitive process of graphic development, producing several logo prototypes with our clients review at each key stage. The resulting logo is reassuringly simple but also bold and strong, conveying a sense of confidence and security. It also has the important capacity to become promptly familiar and instantly recognisable. 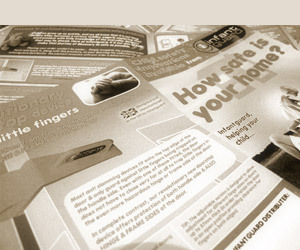 Printed brochures / catalogues & advertising features: As well as packaging design, we have also successfully provided Infantguard with various marketing designs for print, including a doorstep catalogue and various advertisement features which have been published across numerous national publications. An online shopping cart / catalogue and secure online payment system: Enabling customers to browse, view, select and purchase products with ease and confidence. A secure order management and tracking system for use by Infantguard staff: Enabling Infantguard to easily manage and process all orders placed online. A friendly enquiry form: The Infantguard Website utilises a custom written enquiry form providing a friendly and effortless way for customers to get in touch with the company. When the site's enquiry form is submitted, its contents are immediately sent to the appropriate staff at Infantguard, whilst an automated "thank you" response is also courteously sent out to the enquirers email address. Our enquiry form feature also incorporates various sophisticated anti-spam filters. Custom created Flash animation: Infantguard's Website features a fast loading Flash animation on its "Product Focus" page attractively demonstrating the fitting of their revolutionary new doorstop product. In the "want it now!" world of the Web, few surfers are willing to wait whilst a Flash feature loads. Accordingly we are always mindful to create FAST loading and efficiently designed Flash features, ensuring the greatest experience for all Web surfers. Accessibility testing: As with all of our Website's, we robustly tested this site at various key development stages making certain that it would be fully compatible with all popular Web browser packages, (such as Internet Explorer, Firefox, Opera and Netscape Navigator for example). Ensuring the widest available audience: We understand that not all Web surfers use the same Web browser packages, screen resolution or technology, meaning that many poorly written sites cannot be properly viewed by large clusters of Web surfers. With this in mind we take great care to ensure that anything we place on the World Wide Web can be properly accessed and viewed by the widest available audience. Web hosting and email: As with many of our customers, we supply Infantguard with a fast, reliable and professional Web hosting service, delivering their Website to a global audience. We also provide the company with comprehensive professional email services for all of their staff and various departments. 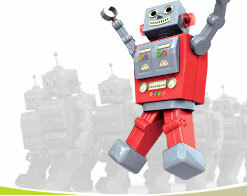 Online security: Good security and customer confidence is the key to any online store (e-commerce site). Accordingly Infantguard's online ordering system is protected by a robust 128bit SSL encryption via a Single Root SSL certificate issued by Equifax, a known & trusted Root Certificate Authority. Simply put this means that any sensitive details entered into the Infantguard Website are protected by a robust & recognised secure connection, supported by all major Web browser packages (Internet Explorer, Firefox, Netscape, Mozilla, AOL, Safari etc). Web surfers accessing Infantguard's secure pages will notice the letters "https" instead of simply "http" in their Web browser's address bar and a small padlock symbol at the bottom of their browser confirming a vaild and secure connection.